Favourite genre of music: Visual Kei, JRock, Metal, Rock, Electro, Industrial, Techno, and anything that sounds alike. 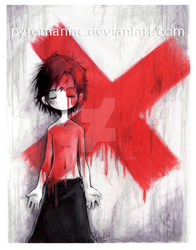 Favourite style of art: Visual kei drawings and anything dark and bloody. Favorite bands / musical artists BAAL, Moi Dix Mois, Angelspit, Despair, D&#039;espairsRay, and many many more. Favorite games Stepmania Tools of the Trade Mah camera :3 Other Interests Drawing, Japan, Visual Kei [music and fashion], Anime/manga. I decided to switch accounts and I will probably keep this account as my photography account. thc for the faves ! Thanks a lot for your fave!